You may not think much about it – but your spine literally supports your entire body. It is responsible for nearly every major move you make during the day. With the need to be strong yet flexible, your spine bends, lifts, twists and turns, supports your neck and shakes your head – in response to your commands. When your spine is in good working order, it can keep you moving right along. But when your spine is hurt, injured or not functioning correctly, the results can be painful, disturbing – even disabling. Having a healthy spine is essential to an active life. Without your spine, you could not stay upright or even stand up. It provides the core support and structure for your entire body. The spine is also the body’s way of protecting your spinal cord. The all-important spinal cord is a column of nerves that connects your brain with the rest of your body. It allows you to control your movements. 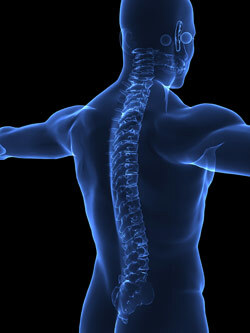 Without a spinal cord, you would be unable to move your body, and your organs would not function. It takes 24 small bones or vertebrae stacked on top of each other to build the spinal column. A disk lies between each vertebra. This soft, gel-like cushioned disk helps absorb pressure and keep bones from grinding against each other. Ligaments connect the vertebrae, bone-to-bone. Tendons connect muscles to bones, and also fasten muscles to vertebrae. Like elbows and knees, your spinal column has real joints called facet joints. The facet joints link vertebrae and add flexibility. The center of each vertebra has a hole. Stacked together, the vertebrae form a hollow tube that protects the spinal cord and 31 pairs of nerve roots. These roots exit the spine through spaces between vertebra, called neural foramina.